Congestion pricing can significantly reduce gridlock by shifting a relatively small share of car trips off the streets, and the subway already carries far more people than the crossings that will be tolled. People with widely varying views on congestion pricing share the worry that drivers will inundate the subways when the congestion charge takes effect. The trains are laboring to handle today’s volumes, the thinking goes. How, then, will they accommodate the commuters whose auto trips will be “priced off the roads” when bridges and streets leading into the heart of Manhattan are finally tolled? It’s a resonant argument, and one I may have had a minor hand in propagating. When my BTA spreadsheet is asked to model the variable-tolling version of the Move NY toll reform plan, it computes 7 percent increases in subway ridership in both the morning and evening rush, or about 30,000 additional riders per peak hour. With Governor Cuomo expected to formally propose a congestion pricing plan in his state of the state address tomorrow, I took a fresh look at the BTA’s subway use projections. This time I ran the numbers with just the “stick” of tolling auto trips off the roads — that is, without the “carrot” of additional trips the subways will attract once the MTA has overhauled and modernized signals, tracks, and communications. The projected increase in subway ridership in this “overnight” scenario differs from the increase in the longer-term scenario, like night from day. The gain in subway ridership shrinks to a sixth of the figures above: to just 5,300 in the morning peak hour and 4,300 in the evening peak. 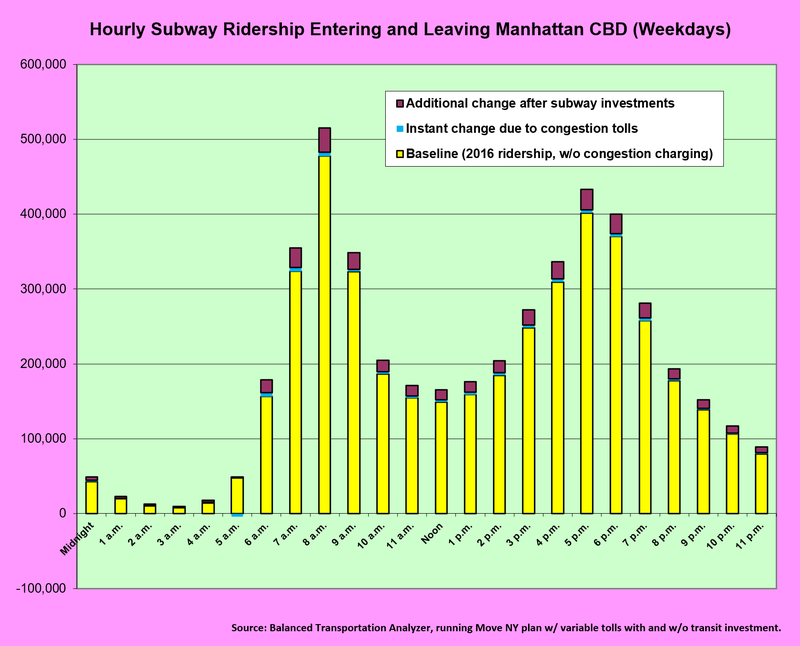 Each increment is just 1.1 percent of current ridership in the same hours, and far less than variations in subway usage experienced from one day to the next. How can this be? How could such a momentous change as congestion pricing trigger only a relative trickle in subway use? There are several reasons. Because of this 5-to-1 ratio, even if every vehicle being dinged with the congestion charge switched to a subway, the number of straphangers would rise by only 20 percent. Second, while congestion pricing achieves a significant reduction in gridlock, it does so by shifting a relatively small share of cordon-crossing vehicles off the streets. The BTA puts the toll-caused decline in CBD-bound car and truck trips at around 60,000 — or 10 percent of the current base of 608,000. The attrition in the morning peak period will be less because most trips at that time are work-related, making them less sensitive to the price jolt from the congestion charge. Last, car trips to the CBD are less concentrated in peak periods than are subway trips. The 8-9 a.m. hour accounts for just 6 percent of total daily car and truck trips to the CBD, compared to 11 percent for subways. While the latter figure underscores the intensity of rush-hour crowding on the trains, the nearly two-to-one ratio further attenuates the impact of the subway influx from car trips priced off the roads. Multiply those three factors — the current 1-to-5 ratio of untolled cars to subway riders, the 1-of-10 share of car trips predicted to be priced off the roads, and the roughly 1-to-2 ratio of peak-hour car to peak-hour subway shares — and you literally get 1 to 100: the 1 percent immediate bump predicted for subway use from congestion pricing. This is not an argument against adding transit capacity during the run-up to congestion pricing. Quite the opposite. Intuition dies hard, and the “optics” of congestion pricing require that transit and transportation providers step up with the kinds of tangible enhancements to trains, buses, and bikeways that TransitCenter outlined last week. Moreover, the watchword during the countdown shouldn’t be to just scrape by but to offer New Yorkers quantum improvements in commuting time and experience. And bear in mind that we’re going to need expanded transit provision to fully accomplish congestion pricing’s mission of converting large numbers of car trips to non-automobile modes. When the carrot of transit investment is programmed back into the BTA, it calculates that for each 100 auto trips that stand to be disappeared more or less immediately by the price stick, another 45 to 50 will be eliminated over time as the better-transit carrot kicks in. Let’s not leave those car trips on the table… or on our streets. Supposedly one of the goals is to push these trips to the outer bridges right? 21% is a lot of traffic that’s ripe for taking off the streets… Can the other crossings handle it? Interesting. that’s honestly less than expected. Is most of the ‘reduced congestion’ projected from MoveNY coming from this decrease, or from the decrease in toll shopping? And bear in mind that we’re going to need expanded transit provision to fully accomplish congestion pricing’s mission of converting large numbers of car trips to non-automobile modes. What will be needed is a functioning system. This morning 28% of trips scheduled to originate between 6 and 9am did not depart. This is a bit worse than the performance back in March/April of last year when real time data for only lines 1-6 and the L was available. What are the reasons that some scheduled trains don’t run? Isn’t the hope with congestion pricing that buses, particularly express buses, from the outer boroughs will be able to move much more smoothly through midtown, and therefore will attract more riders? I’m just collecting and analyzing data that’s publicly available. I brought it up here because I believe Mr. Komanoff’s assertion of not needing more capacity is correct. I differ with him in his judgement that the MTA can handle any a modest patronage increase. I believe they cannot handle what the have and this data suggests that I’m correct. To your first Q — I think my sloppy writing tripped you up. 21% is the share of trips into the CBD that go through it and “land” somewhere else. Compared to trips that land in the CBD, more of these through-trips are projected to disappear. But a majority of them will persist, i.e., they won’t be priced off the roads, according to my modeling. Re second Q: most of the travel-speed gains from c.p. are due to fewer trips, as opposed to ending toll shopping. This whole article can be simplified down to “Cars are REALLY REALLY inefficient at moving people…that’s why”. Bicycling should get a lot easier at the same time. THe city helped create this problem with bike lanes, plazas, and slower speeds. Also very little traffic control where blocked intersections rule. Also Uber cars are most of the traffic sometimes and alot of the traffic most of the time. So tax the drivers who are not the majority but trucks, buses and cabs. The traffic will not be much better as it gets worse every year. In a few years we will be back to worse traffic and they will raise the toll to $ 20 or $30 a day. Also they will charge off hours even though there is no traffic. They want money and at some point ny citizens and visitors will leave. I plan to close my business in NY and move it to another state in 2020. Bye NY. Why is Andrea Stewart-Cousins allowing the tyranny of suburban drivers over suffering city transit users? Ignore the Rupert Murdoch lackey on congestion pricing — mostly because he doesn't care how non-drivers get around.